Below is a photo of my third attempt at home milling and sifting, which resulted in a flour very similar to my favorite "high extraction flour", Heartland Mills Golden Buffalo flour. The processes used on my second and third tries are explained further below. Additional photos of the process have been posted. The first bread from my home milling and sifting project, blogged earlier, looked like a 100% whole wheat bread. Unfortunately, I still hadn't figured out a way to do home ash content testing, but from the results, a guess at the ash content of the flour that went into my first try might have been something like 1.4%. 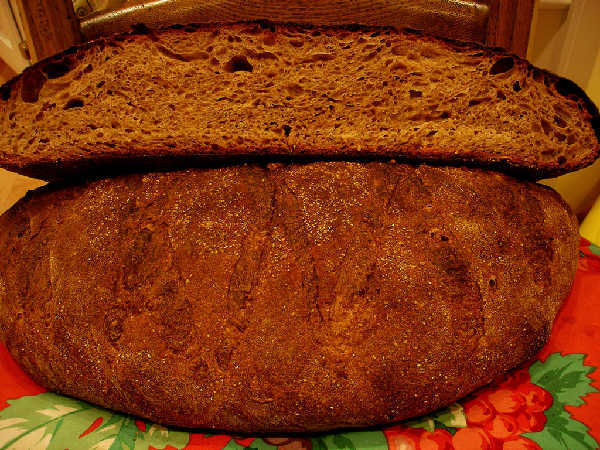 So, it had some of the darker material sifted from it and therefore had a lighter crumb than a 100% whole wheat flour might have produced, but the color and flavor was closer to 100% whole wheat. My second try was a little lighter but still closer to whole wheat in character. I allowed the sifting process to go on longer and used a couple of passes. After one pass through the Retsel mill at a fairly fine grind and then sifting through a stack of sieves (#25,35,45,60,70,80) on my sieve shaker, the breakout was as follows. A video of the equipment in operation is posted for fun. I then took the 219g caught by sieves 35,45, and 60, and re-milled them at about the same settings as the initial milling. The output of this second milling was then fed through the #60 sieve. The output was 53g of coarse material caught in the #60 sieve and 156g of somewhat creamy, grayish flour that went through the #60 sieve. I then created a flour that is about 82% extraction by combining the all the flour that fell through the #60 sieve on the first pass with enough of the flour that fell through the #60 sieve on the second pass to constitute 82% of the total output. The resulting flour was lighter than on my first try, but the bread that resulted still had a color more like a whole wheat bread, although slightly lighter in color. The flavor was noticeably different, though. The second try had a flavor with far less of the grassy flavor of a whole wheat bread. Again, this flour was made before I had a way to test for the ash content, but I imagine from the color of it, that it was probably about 1.25% ash content. It was slightly darker than Heartland Mill Golden Buffalo flour. My second bread also had 5% whole rye and 10% whole spelt in it, as did the first one, so part of the whole wheat character of these loaves is caused by the addition of 15% whole grain flour. I received my Meadows 8 Inch Stone Mill and decided to have another go at milling and sifting. Of course, the new mill works differently than the Retsel. The stones are much larger and turn much faster. I can't seem to get the grind anywhere near as fine as the Retsel will produce with just one pass. However, the Meadows mill is far faster, especially when re-milling flour. The Retsel takes forever to re-mill flour, and seems to heat up too much on a second milling. The Meadows Mill takes less than a minute to grind a few cups of grain, and re-milling the output takes only slightly longer. I was happy to discover that for the amounts I would normally do - not more than a 5 pounds at a time, the flour was very cool coming out of the mill. In fact, it was noticeably cooler in temperature than the flour coming out of the first pass with the Retsel mill. I imagine that equation would reverse for much larger amounts, as the Meadows would heat up over time to a higher temperature, given the large stones turning at much higher revolutions per minute. This time I went for about a 70% yield. I realize in retrospect that my first pass was probably too coarse, which resulted in only about 600 grams going through the #60 sieve and 323 grams caught in the #25 sieve, out of a total output of 1815g. I then re-milled the middlings from that sifting, and the output was 350g through the #60 sieve. One more pass resulted in an output of another 244g through the #60 sieve. The flour coming through the #60 sieve from this pass was lighter than previous attempts. I did another sample of about 300g which was milled at the finest settings a couple of times. The result was a finely milled whole wheat, more like what would be done on a very fine first pass with the Retsel. The result was sifted through a #25 and 50 sieves to get 240g of flour, with only 15g of "bran" caught in the #25 sieve and middlings of only 40g. This was probably too fine. I'm slowly beginning to understand what setting of coarseness of the mill will result in a good distribution of particle sizes for more efficient sifting to get the flour desired. The resulting flour was actually 68% of the total flour made during this session trying a couple of different strategies. This time, I was able to measure the ash content, at least approximately, using the home ash content measurement mentioned in a previous blog entry. The ash content is around 1.05%, maybe a little lower than Heartland Mills Golden Buffalo flour, which their site says is around 1.13% ash content and I calculated to be around 1.2 with my test, such as it is. A similar bread to previous attempts was made with this flour. However, I omitted the 10% spelt and raised the hydration to about 81% to compensate. I may have gone a little too far with the hydration, as I had some trouble getting the loaf to hold its shape well. Due to some unanticipated distractions, the loaf was about 20 minutes late getting into the oven, so it was also slightly overproofed. The result was therfore flatter than I would have liked. However, the crumb, crust, and flavor were all very good. I believe this loaf is very similar in most ways to country miches made with Heartland Mill Golden Buffalo flour in the past. The color is a little darker, but I believe that has more to do with the fact the flour is not aged, as the ash content clearly indicated that my flour was lower in conductivity than the Golden Buffalo flour and should therefore be a little closer to white flour than the Golden Buffalo flour. The texture of the dough and the general behavior of the flour while handling it seemed very similar to what I have experienced with the Golden Buffalo flour. By the way, the wheat berries used for this flour was Heartland Mills M2, which may be similar to the wheat berry product they are using to create the Golden Buffalo flour. Overall, I'm extremely happy with this result. The flavor and freshness of the home milled flour is a delight, and the prospect of being able to freshly mill a desired grade of flour on demand is pleasing. Now that I have a better feel for the right mill settings, my plan is to do a multiple pass approach, this time hopefully more systematically and with better mill settings. The outputs of the various passes will be saved and ash content measurements performed on each one. Hopefully, I can then make the process much more efficient and flexible. With ash content measurements available, blends can be created based on ash content of the final flour desired, and hopefully better yields will result for the same ash content, with better coarseness settings on the mill on the first and subsequent passes. Did you get a Rotap machine? Did you seriously go out and get a Rotap machine and a set of brass sieves? If so I hope you found it at a a surplus sale and not new! This one is not a Rotap. It's from CETEC, the SS-100 model. It's not quite as expensive, but it seems to do the trick fairly well. I found it helps to put a few silver dollar sized steel washers in there. Also, I'm a little worried about the possible health effects of getting brass dust in the flour. So, I've also acquired a few stainless sieves, now that I know the sizes that seem to work the best. My bout of insanity is not over yet. I'm still mulling over getting a Meadows Mills flour sifter. It's designed to sift flour and looks like it would do a much faster and better job than this semi-automated approach with the sieve shaker. The Meadows Mill 8 inch Stone Mill is a kick in the pants. The speed is amazing compared to the little Retsel Mil-Rite, of course. So far, I haven't figured out how to make it grind as finely on the first pass, though. Still, it was very effective for creating the flour for my "third try", which was my favorite result so far. I'll do more with that in the next phase, and I'll try to show a few photos or a video of it cranking away. I plead guilty as far as the impracticality of it all at some level. However, there really is some logic to it, if a little strained - some method to my madness. If I can make it efficient, fast, and convenient, then in addition to the hard-to-price but highly valued true freshness on demand and the flexibility of flour grades and grain types possible, it clearly is cheaper to home mill. The cost of the equipment will be recovered, even if it takes a few years. If I knew exactly what I wanted and shopped for it, the recovery time and investment could be significantly less, but in this experimental stage the cost of trying things has been high. The bread experiments are cheap compared to going sailing. The more time I spend on this bread rampage, the better, if you look at it that way, hehe. Your posts keep me waiting for your next project. I love how you attack it from the technical standpoint. I do not know if you have already read this, but it has some info. you might find interesting. Page 7, first column, mentions your Stone Mill. Your new oven looks like its doing a right proper job of baking as well. I haven't read that newsletter. Thanks for pointing it out. It sounds like Meadows is one of only a few choices, according to the article. I bought it mainly because the Pleasant Hill Grain people seem to be knowledgable and helpful, and it was the one choice with some larger capacity other than true industrial mills on their web site. They had many choices for micronizers or hand mills for the kitchen, as well as attachments for DLX and others, but I wanted to produce more like 2Kg of flour at a time and wanted a stone or steel buhr mill, not a hammer mill. Bill, I am amazed. This is some very cool stuff. Thanks for posting it. Thanks for your updates and the leads on the sieves. I went with the plastic versions and have already had considerable "fun." Haven't felt the need for the sieve shaker - but Iwork at lower volumes than you. Anyway, have you done any work with tempering prior to milling? Everything I read says that the tempering process is crucial to flour quality. After a fairly messy (but not completely unsuccessful) first experiment with tempering, I have tried adding about 2% by weight of water to my wheat and allowed it to rest for about 36 hours. I have much experimenting to do, but have found that my first attempt at tempered flour was also my first batch of really satisfactory home milled flour (got some "good" results earlier, but nothing like this). Also, have you considered milling processes and starch damage? I am considering that a few passes at increasing fineness of grind would reduce starch damage. I'm learning little by little, and this was a question I also had. I wasn't sure if purchased wheat berries are already tempered or not. Clearly, they are processed significantly, since what I've received from both Wheat Montana and Heartland Mill are clean berries with little or no extraneous material of any kind. It seemed they were prepared for immediate milling, so I just went with that program. Could you point me to some good places to read about tempering? I'm afraid I'm well behind on you on this topic, if you've already tried it and found it to be beneficial. 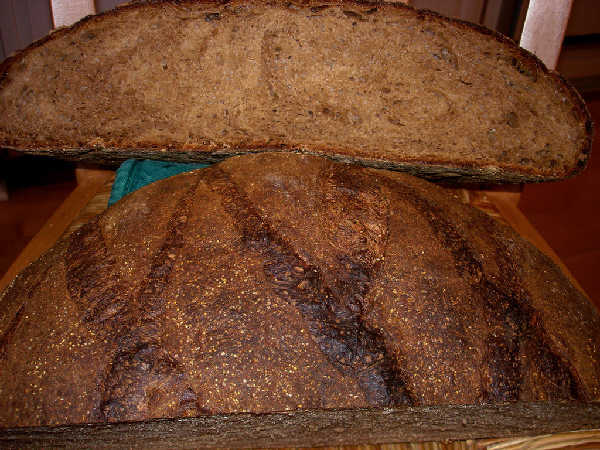 Did you heat the wheat during the tempering? Also, in what sort of container did you put the berries? I'm having a hard time picturing the process you might carry out practically at home. What is the difference you see between tempering and not tempering? In other words what was "good" vs. the "great" result with tempering? Thanks for any insight. Don't tempt me on the alveograph, hehe. In a "real" operation, after cleaning the grains would be put in a tumbler with cool water (or steamed, or with hot water) to toughen the bran (jut put "wheat milling tempering" into your favorite search engine) and get wheat to a certain moisture content. I figured that my grain had been cleaned, but goodness knows what the moisture content might be after it was shipped to me in a paper sack. What I did was simply put the wheat berries and the small amount of water into one of my plastic food storage tubs (a Cambro plastic tub) and "tumbled" it for a few minutes. Then I let it sit on the kitchen counter for 36 hours. On my first attempt, I put too much water in and the grain was actually wet. This was a mess to mill (and to clean up my messed up mill) and I eventually had to let half cracked grains out to dry before milling them completely. My second attempt I put in exactly 2% and the result was wheat berries dry to the touch, but which had absorbed all of the water - this was a better millling experience all around. I also milled the first experiment in 2 passes - 1 a pass to crack the grains and then to a fine grind. My second attempt, I milled in 3 passes - cracking the grain, a coarse flour (gritty to the touch) and a fine flour (silky to the touch). What I saw in my baking results is that the first batch of flour did not experience the sort of spreading out after proofing that my earlier attempts had. This seems consistent with the discussion on the Heartland mill site on the effects of tempering on starch damage and baking performance. I also set 2 poolishes of commercial whole wheat and my home ground whole wheat so that I could observe them over about 24 hours - for the first time ever, my home grind behaved comparably to the commercial grind in terms of time to ripeness and the ability to recover after being disturbed. I have not yet been able to work with the second batch. I will do so over the weekend. In the meantime both batches will have been stored in the refrigerator for the same number of days - so if storage is a factor, it should be the same for both. I know that aging of the flour is a hot topic, but I have done no experimenting with this. This makes 2 attempts total with tempering, so I'm thinking I have a long way to go, but tempering and staged grinding made a difference over earlier attempts. Thank you very much for this information. I did search on the internet for tempering, and it seems to return many commercial mill related discussions. Much discussion in the context of home milling was hard to find, though. Knowing that you tried this and found it to work is invaluable in deciding what to try, as I continue my explorations. I wonder if after tempering maybe I will see more normal bran flakes. In my first tries, especially with the Meadows Mill that seems to give coarser results than the Retsel at its finest setting (much, much faster, though), the "bran" I got probably had a lot more white material attached to it than I would've expected. I know there are special machines for separating out the bran, but maybe tempering would give me better results out of the stone mill's first pass. Your experience with three passes sounds very much like what I suspected needs to be done with the Meadows Mill. I had the same experience that three passes gave me a very fine whole wheat flour, when I just ran three passes repeatedly with the whole wheat each time on a small sample. Now you have me wondering how hard it might be to estimate the moisture content of my grains without going to great lengths. Could you simply warm a sample of berries in the oven at a low temperature for a long enough period, or maybe a sample of whole wheat flour, and then weigh sample before and after? Or, maybe there's a not-too-expensive digital meter for this, too, but it sounds too good to be true. I very much like your idea of building poolishes, or in my case maybe a sourdough levain which I am so familiar with, to observe and compare the rising, peaking, and collapsing behavior of a known similar flour with a test flour. I too have been wondering about how to measure moisture content (with no conclusions as of yet). (I wonder if there isn't something in the garden dept. that could be used to measure moisture...) In a way, this whole adventure gives me greater appreciation of the millers of yore - who relied on their senses and not analytic test equipment. I think that I need to run more careful comparisons of tempered and untempered wheat, observe differences at each stage of milling, and run the poolish tests. I also work with levain, but decided to use commercial yeast for testing just to control out one more variable. I will keep checking back for more of your milling posts and certainly let you know if I stumble across anything else. I went and got a Delmhorst G7 Grain Moisture Meter. It's extremely simple to use, and I was able to determine the moisture content of my berries. They ranged from about 9.6-10.6%. I also spoke to someone at Meadows Mills who suggested that somewhere around 12.5-13 might be a good target moisture content for their mill. So, your 2% addition would be perfect in that context. I read in a wheat milling text book that a typical moisture content after tempering should be 14-17%. That may have been for a roller mill, though. I hadn't talked to the representative at Meadows and had already tempered my berries to 14%, so I gave it a try, being sure to use a fairly coarse setting for the first pass to avoid problems with the possibly excessive moisture. It all went fine, although I could tell it was ever so slightly damp. If I had run a lot more grain through the Meadows Mill, my guess is that I might have had some trouble. Next time, I'll temper the wheat berries to about 13%, I think. The sifting went well with the tempered wheat, and I'm working on ash content measurements for the separation. I'll probably write some details about that, once I have the data. Checked out the moisture meter which is a little too rich for my blood at the volumes at which I work, but I'm interested in your results. My wheat really was down to no perceptible moisture - but I live in the Rocky Mountain area, so dry is what we do. I grind with a Diamant hand mill and damp grain just clogs up the grinding plates. Just about all wheat milling textbooks seem to be for roller mills and there seems to be a big difference between these and the type of mills we use at home. I'm curious as to why you are focusing on ash measurement. 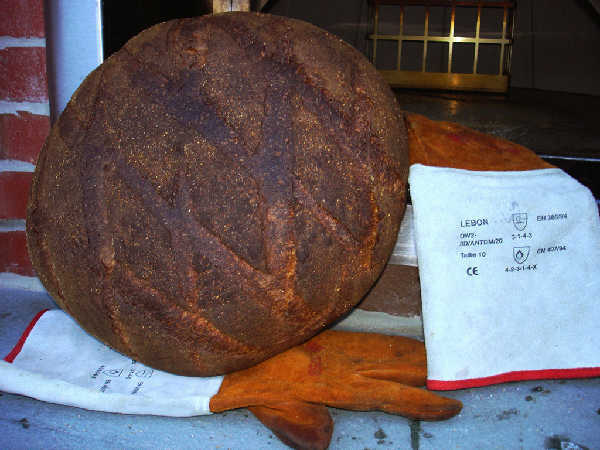 The technique is cool, but it seems that ash content has the least impact on bread quality of the remaining variables. C'mon...go for the alveograph...you know you want it! Yeah, that meter is a little pricey, but now that I've gone so far down the road with overkill in all the other areas on all this, I went ahead with it. I bet that some of the ones that are around $150 would work well enough to be very useful. However, assuming the storage is hermetically sealed and the sources are consistent, it may be as simple as adding 2-3% and being done with it. I rigged my grill rotisserie to a couple of posts and turned a small plastic drum with 2Kg of wetted berries in it for a few hours. Before that, I sprayed the water in 2-3 gram shots, stirring the berries in between, to be absolutely as uniform as possible to start with. I don't know if all that mattered, but the result did seem very uniform and there was very little moisture at all detectable on the surface about 24 hours later. Ash content is more concentrated in outer layers, so it is a way to get an objective measure of how much of the bran and outer coatings made it into the various milling and sifting outputs that result from the multiple passes I'm doing. It's a way to identify how well I'm doing separating the outside from the inside in the various passes. It seems like a standard way to classify flours, although I understand that many other variables will affect the baking quality, like the starch damage or the amount of protein that makes it into the flour and so on. I guess I'm assuming that the protein level will be mostly a function of the berries, i.e. whether they are Hard Red Spring Wheat or Hard White Spring Wheat or Hard Red Winter Wheat and from what region they are, since the flours I'm using are high extraction and should include most of the gluten containing parts of the berry. I'm also ignoring starch damage. I'm hoping that stone milling in successively finer passes will result in the right amount of starch damage, but that's just a way of ignoring what I'm not able to measure, I guess. Do you feel that the rising tests are useful, and can you correlate them to a particular milling/sifting strategy? So far, I'm having a hard time telling how coarse to mill on each successive pass. I just finished doing session, now that I can mill and sift fairly quickly between the Meadows Mill and the sieve shaker, and I ended up doing 6 passes. Four of the passes were straightforward successive re-millings of the stuff caught in a #60 sieve, each yielding more through #60 "flour". It turns out my whitest flour came from passes 2,3,4, not from pass 1. One of the other two passes came about from re-milling the bran from pass 1, which yielded some high ash white flour and a more refined bran. The last pass came about from taking the coarse red stuff caught in a #40 sieve after pass 2 and the coarse red stuff caught in a #60 sieve in pass 4. This last pass also yielded some high ash white flour through a #60 sieve. The result of all that mess above, probably combined with better milling from the tempering process, was that I got about 85% yield for a flour with the same ash content as Golden Buffalo flour, which is way better than my last try, which only had 68% yield for a flour with about the same ash content as Golden Buffalo. Also, I now have gradations all the way down to about 30% flour that would be pretty close to white bread flour. I don't really have any use for going that far most of the time, but it's interesting to see that I can get down to ash content around .65% for a reasonable fraction, like 30%, of the flour. I'm imagine that with a #80 sieve, I could do even better at the low ash end of the spectrum. Anyway, I'm not sure where I'll end up. Right now, the biggest issue is probably getting more consistent and efficient with the processing and then try to understand what the baking quality is like. Some baking quality measure sounds good, but there are so darn many variables, that I'm not really sure how to attack systematically at this point. I was also pondering the less expensive meter. Right now my next "you must be nuts who needs that kind of thing" purchase is a refractometer (I make jellies/jams/candies) so my wheat must wait. Get your ratonale on ash content. It is interesting that your yield increased so much with the tempering. Seems like it is a good idea. I like the rotisserie idea for tumbling - I may try that one on a future run. On this weekend's batch I have so far put .4 oz of water into 8 oz of white winter wheat berries. At about 12 hours they still feel dampish, but I am convinced they will be dry by tomorrow. This weekend I intend to go "old school" on this and mill untempered wheat at the same mill settings as my tempered wheat and just observe differences in color/texture/weights etc. I have been sifting with a #30 sieve and to my eyes - the flour is as fine as KA white whole wheat. I may try a finer sieve. I'll take copious notes this time and post results. I like the rising tests just to make sure that something nasty hasn't happened in the process before I go and do a full loaf. Last year I got ahold of some bad wheat and I nearly lost it thinking that I had somehow forgotten how to bake. I'm thinking there is something to this starch damage aspect, and of course the questions of malting and ageing are still ahead. One last test to consider - a Pekar test - no fun equipment here, but worth researching. I was introduced to this test by a baking teacher and he encouraged me to do some experimenting with it. Haven't fully researched it yet, but need to. Just wanted to give you my results. I did two batches of home grind - one tempered, one not. On the first two mill passes, the tempered wheat gave somewhat higer extraction rates. By the third pass, however, I was getting 91% extraction rates on both (remember I am using a #30 seive) - any quantitative difference could be written off to measuring error. Qualitatively, the bran from the tempered wheat was "flakier" and "fluffier" than the non tempered. The non tempered brand was more granular. Doing a poolish test - I really would have been hard pressed to tell the two samples apart. So, my low tech methods seem to be paralleling yours. Which might be encouraging to home millers who need to stay "high touch." I have some professional obligations that will prevent me from milling and baking for the next few weeks, but I will keep checking your blog. Really, you need to get the analytics of alveograph and falling number on your flours. While you have really passed the "home miller" stage, this would be very beneficial to people contemplating "artisan miller" status. Your results do parallel mine. The quality of the bran was much higher for me, as well, with the tempered wheat. That should mean there was better separation of the bran from endosperm, at least that's what I imagine, musing as a novice about it. It makes sense that the higher quality of the bran may mean better rising characteristics, since hopefully more of the parts of the bran that interfere with the gluten may have been removed for the same amount of flour. For me, the analagous result was that I had both higher yield and lower ash content with the multi-pass tempered wheat attempt. The dough handled much better, rose more, and had better oven spring, as you would expect from a whiter flour. 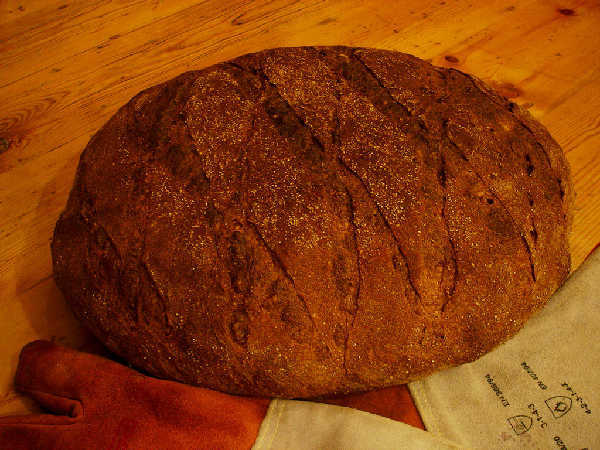 My objective is not to create white flour, but I like that idea of country style miches and other rustic loaves made with high ash content flour. I prefer the flavor and texture of breads in between white and whole wheat to both pure white and pure whole wheat loaves. So far, my favorite flour has been the Heartland Mill Golden Buffalo, which is why I keep using it as a standard for my own results. As far as I've gone with this, it's hard to picture obtaining laboratory flour testing equipment. I imagine it to be multiples of what I've spent on a mill, sifter, moisture content meter, and pH and conductivity meters. I suppose sending the flours to a testing lab could be an alternative, although the turnaround time is so great that it's hard to get excited about it. Thanks for sharing your experience. You helped me a great deal with the tempering pointer, and it helps to get some corroboration on the results of the techniques being tried, too. The laboratory equipment is, indeed, a big expense and not practical for even an artisan miller. After all the proof's in the baking, right? Alas! My tiny engineer's mind will always want the numbers. We must learn to live with disappointment, eh? If I come across any leads on labs that can give you good turnaround, I'll post back. My baking teacher challenged me to get involved in this milling experimentation (I think it was his way of saying "Stop bugging me..."). Now my challenge is to see if my little old hand mill and plastic sieves can duplicate your results. I am now convinced it can be done. Thanks for all your hard work and maniac miller inspiration. Don't know if you are checking back here, but here is a link to a flour testing lab. I would guess that a full range of tests might be pricey (but not really out of reach to do alveograph, Falling number, and starch damage) - but they promise good turnaround. You might want to send a sample of "Bill's Best" just to see how it tests up by the numbers. Thanks for the link. Somehow, in searching around on the net, I didn't come up with this link. I'll check it out. The array of possible tests is a little bewildering. I need to read up now on all the tests that are possible and see if I can boil it down to the few most valuable tests. I'm curious what your idea would be for the order from highest priority to lowest, if you were going to choose a set of tests? It seems like some of these tests are at least partly redundant. It seems like you want to know something about the gluten strength, starch damage, ash content, and the fiber content? I'm not sure which tests will boil things down most effectively. I definitely haven't read enough about flour testing yet. Also, I added an update to the more recent blog entry with some results of my use of the Meadows Eccentric Sifter (http://www.thefreshloaf.com/node/5518/home-milled-and-sifted-sourdough). Interestingly, the milling session was more troublesome than my last, and I think it was because of not tempering for a long enough time and maybe not to a high enough moisture content. The bread still turned out well and was close to my last result. However, the flour was not as "white" as the flour from my last attempt. If I were to do only one test, it would be the Chopin alveograph or a farinograph. If you have the (excellent) Hamelman book - he spends a great deal of time explaining the meaning of both of these tests. KA flour does the farinograph, but in his writing Mr Hamelman expresses a great appreciation for the alveograph. I would, then in order of priority do a Falling number (measuring alpha-amylase activity) and then the starch damage test. These three tests seem to cover the major variables that account for flour quality. This tempering thing is a strange beast. As the advertising coppy suggests, long tempering produces better flour I did some milling this weekend with a 36 hour temper and with 5 passes through my hand mill and hand sifting with a #30 and then a #50 sieve came up with three separate little piles - fluffy bran, nice white flour and a little pile of brown granules that I presume to be finely ground wheat germ. What this site needs is a little database of milling attempts :>). I do have and very much like the Hamelman book. I'll go read what he has to say about testing. Your milling experience after 36 hrs of sifting sounds like my previous attempt. This last was more troubling, and I bet it's because I didn't put the time in on the tempering. It stands to reason, as the explanation I read in the Wheat Flour Milling book by Posner and Hibbs explains that the endosperm softens as the moisture seeps into the center of the berry and is more likely to grind into flour dust instead of cracking when it is soft. Also, it suggests that short tempering can be used on purpose to create a coarse granular product. I do understand that hand sifting is perfectly reasonable. However, I tend to do about 2 Kg of flour at a time because of the size of my brick oven's chamber. So, I usually would want to mill about 2.5-3Kg of berries at a time. It's an interesting trade-off. It reminds me of the mixing dilemma. I used to do all my mixing by hand and can certainly hand knead dough made with 2Kg of flour. By hand, it's less messy - just a bowl, scraper, and counter - and if you use wet hands and counter, there is very little flour left on anything. Also, you get a great feel for the dough's condition. However, a while ago I got a DLX mixer, and it is nice to quickly and consistently mix the "epoxy doughs" that mix a levain, soaker, or mash with final dough ingredients. Lately, I seem to use the mixer, but I think about not having to clean the mixer every single time after my binge with the power tool. Anyway, I found hand sifting 3 Kg of flour to be a little tedious and tried the shaker. There, the trade-off isn't so good. You have the hassle of loading it and messing with all those sieve stacks repeatedly, the mess is still there to some extent, and it makes a huge noise, so it isn't that great. The Meadows approach is drastic, I'll admit. It is very fast and relatively quiet though, and it may be like the DLX - very fast and effective but with some buyer's remorse at cleanup time. I will say this. I've had a hugely fun time learning to mill and sift flour and haven't even scratched the surface. Also, the bread tastes just great. So far, it's been good. I am going to look into testing, too. I will need to do a much larger run than usual, as it looks like you need pounds of flour for the various tests, and if I'm going to go to the trouble to get these tests done, I want to test several of the "piles" resulting from the session and maybe a reference flour or two, as well. I'll admit, I'm a small scale operation. I also admit I have a bias towards hand powered processes. After reading your posts, I was prepared to really need to put effort into sifting - I was pleasantly surprised that it went so quickly and easily - which should be encouraging to aspiring home millers who can't spring for all of the equipment. I do all of my breads by hand. Even if I do a large batch, I use a hand cranked dough bucket. What I also appreciate as I meander down this road is the refinement of product that can be achieved with attention to technique and (for me, at least) fairly simple equipment. I find also that doing things by hand brings me an appreciation of the effort that for centuries went into just providing the trappings of life. Case in point, you may have seen actual mummy wrappings - or at least seen pictures of them (this has a point, promise). Most people think they are kind of cool. But I am a handspinner who has grown, processed and spun linen. When I look at the fineness of the threads I know first hand the incredible investment of time and skill that went into them - I am totally blown away. I believe that deeply experiencing the process brings a depth of enjoyment to life. Looking forward to the test results! All good on the bias for hand power. I relate well to your interest in how things were done in the past and the admiration for what was done with ingenuity and hard work, and with far less technology than we have today. It's one reason I enjoy another hobby, going sailing, which is partly a way to be outdoors, partly an enjoyment of an ancient wind powered skill, partly admiration for some very tough people who engaged in exploration, trade, fishing, and so on, and yet for me has an inevitable counter-current of dabbling with technology and gadgetry, too. Very interesting about the mummies. I remember hearing somewhere, but don't know if it's true, that grain was found stored in the pyramids that was still usable after millenia. I've fallen to my gadgetry and science bugs when it comes to bread making, especially with this latest endeavor, but I've also enjoyed doing it by hand with only minimal equipment on a boat or when visiting friends, and even once in a while at home. I'll have to see what it's like to hook up the hand crank on my Retsel. They claim to have designed it to work well with the hand crank, even though it is powered with an electric motor normally. Thanks for all the tips and thoughts, as we've discussed this home milling experiment. It may be a while before I gird myself to very carefully and systematically mill and sift up a series of batches to hopefully send out for testing. If and when I manage it, I'll certainly come back and let you know how it goes.